In 1682, the year after King Charles II of England signed the new charter with him establishing the Province of Pennsylvania, William Penn drew up a Frame of Government for the Pennsylvania colony. Freedom of worship in the colony was to be absolute, and all the traditional rights of Englishmen were carefully safeguarded. Penn drafted a charter of liberties for the settlement creating a political utopia guaranteeing free and fair trial by jury, freedom of religion, freedom from unjust imprisonment and free elections. 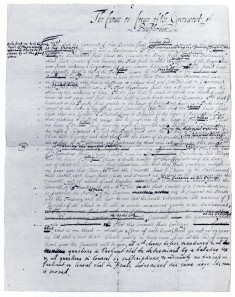 That same year he drew up the original Frame of Government for the colony that would, he said, leave himself and his successors “no power of doing mischief, that the will of one man may not hinder the good of a whole country.” Freedom of worship in the colony was to be absolute, and all the traditional rights of Englishmen were carefully safeguarded. Penn wisely included in the Frame an amending clause—the first in any written constitution—so that it could be altered as necessity required. Notably, as the sovereign, Penn thought it important to limit his own power as well. The new government would have two houses, safeguard the rights of private property and free enterprise, and impose taxes fairly. It would call for death for only two crimes, treason and murder, rather than the two hundred crimes under English law, and all cases were to be tried before a jury. Prisons would be progressive, attempting to correct through “workshops” rather than through hellish confinement. All this was a radical departure from the laws and the lawmaking of European monarchs and elites. 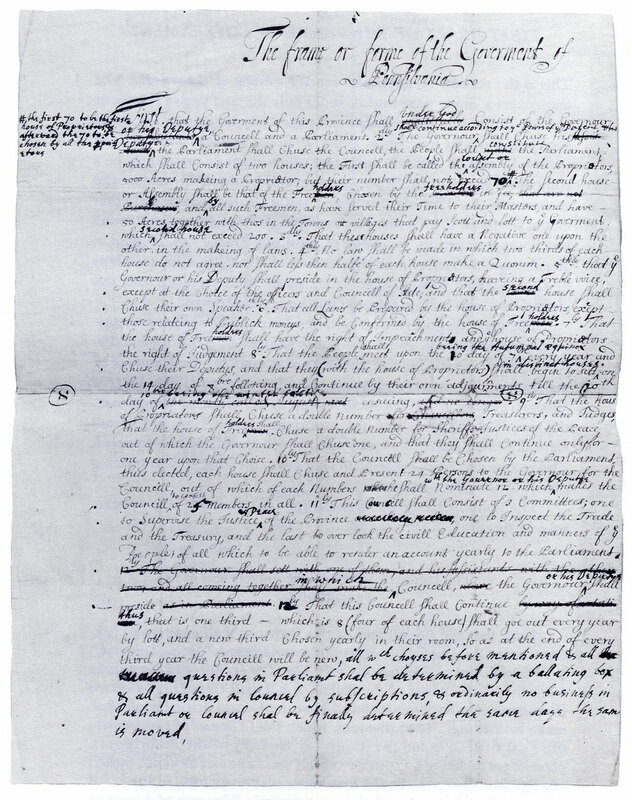 Over the course of twenty drafts, Penn labored to create his “Framework of Government.” He borrowed liberally from John Locke who later had a similar influence on Thomas Jefferson, but added his own revolutionary idea—the use of amendments—to enable a written framework that could evolve with the changing times. He stated, “Governments, like clocks, go from the motion men give them.” Penn hoped that an amendable constitution would accommodate dissent and new ideas and also allow meaningful societal change without resorting to violent uprisings or revolution. The fiftieth anniversary of the Frame of 1701 was celebrated with the creation of the Liberty Bell. 3. Dobrée, Bonamy. William Penn: Quaker and Pioneer. Houghton Mifflin Co., New York, 1932.